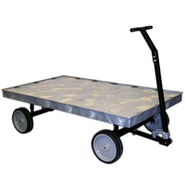 Ideal for transporting heavy or bulky loads in manufacturing, industrial, and groundskeeping settings. Constructed of a structural foam body. All wagons come standard with a T-Bar Handle for pulling by hand, optional tow package allows for Pintle or Hook & Eye hitching methods. A rear hitch allows training several wagons together to eliminate multiple trips. Increases capacity to 20 cu. ft. (.6m3) and helps keep small loads intact.